This large-scale replica of a handwritten open letter is a radical contribution to the genre of portraiture. Lindeman’s painting is a conceptual portrait, perhaps conveying more about the sitter than any conventional portrait painting. ‘I wanted to create a portrait that presented some of the conditions that a contemporary artist must deal with, in order to find their place in society and contribute something new to culture,’ he says. Through a shared experience with the viewer, Dear Trustees (self-portrait) aims to distil and connect with many emotions. The portrait is at once sad and humorous, sarcastic and sincere, absurd and deeply serious. The act of translating what is ordinarily an intimate gesture – a handwritten letter into an amplified painting on canvas – results in a portrait that is courageous and abandons any pretension. 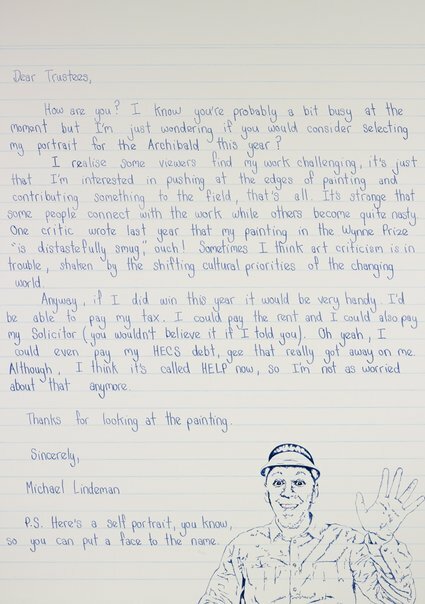 Lindeman admits he was initially slightly anxious about submitting it for the Archibald Prize but was encouraged to do so by his art dealer. Lindeman has been working in the area of conceptual text painting for sometime now. He is committed to creating paintings that challenge the audience and provoke discussion and interest in contemporary art. In 2010 he was awarded the Sulman Prize for one of his text-based works that precisely replicate published classified ads. In 2011 and 2012 he was a finalist in the Archibald and Wynne Prizes respectively, and this year is also represented in the Sulman Prize.